As you would expect with a solution designed to work across different types of network topology, NetSupport Manager also includes, as standard, its unique Gateway technology. This allows for a secure connection between different sites over the internet, guaranteeing that all machines requiring support can be located and connected to seamlessly – and ensuring that all data transmitted across the network (local or remote) carries the highest levels of security and encryption. 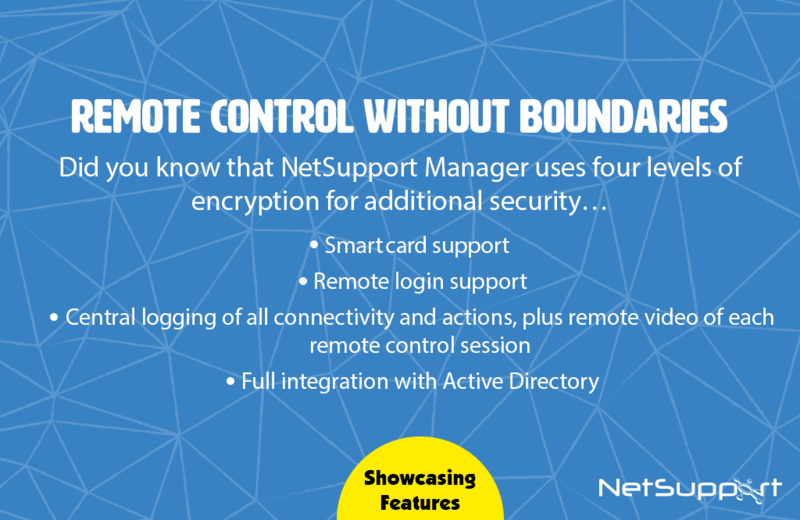 In addition, NetSupport Manager’s “PIN Connect” feature allows quick connectivity with users simply by sharing a matching code. • Full integration with Active Directory. AD integration not only ensures control of which domain rights users have to be able to connect to desktop PCs, but also that the configuration of the technology on each one is always maintained to ensure full and maximum security at all times.